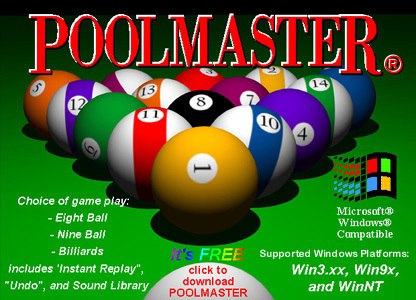 LOOKING FOR THE BEST BILLIARD SOFTWARE FOR WINDOWS? "POOLMASTER is about as real as billiards gets without having a table... ...You can do anything that's possible with a real pool cue, all with the click of a mouse... ...Balls carom around like the real thing, and even make a satisfying "click" as they bounce off one another... ...I've spent literally hours with POOLMASTER. Who knows? It might even improve my real-life game... Paul Newman, watch out." Click here for the complete POOLMASTER Review. "Shoot pool like the real thing... The shooting mechanism is one of the best we've seen in a pool game, both intuitive and accurate... Ball physics are good, too... The sound effects are very true-to-life, with harder hits producing louder sounds... We've seen a fair amount of pool games, and Poolmaster ranks with the best and most fun..."
8Ball, 9Ball, Rotation, Straight Pool, and Billiards. Play against the computer, or another player. POOLMASTER® Version 2.006 from Micro Amusement Corporation. Click the ABC4KIDS button (above) to download ABC4KIDS now! (It's FREE) Learn to identify alpha-numerics, keystrokes, sounds and more. CHESSter is Online CHESS at it's finest. No Login. No ActiveX Controls, Cookies, Spyware, web bugs, Trojan Horses, or Viruses. Play your friends through this portal. Even play multiple games simultaneously. Chess aficionados will love this one. PLAY CHESSter - IT's FREE! © Copyright 1994 - 2019, Micro Amusement Corporation, a division of THEOmega.NETwork. POOLMASTER is a registered trademark and CHESSter is a trademark of Micro Amusement Corporation. Microsoft, Windows, and the Windows Logo are registered trademarks of Microsoft Corporation. PC Magazine and the ZD-NET logo are a trademarks of ZIFF-DAVIS Publishing Company. All other trademarks and registered trademarks belong to their respective holders.